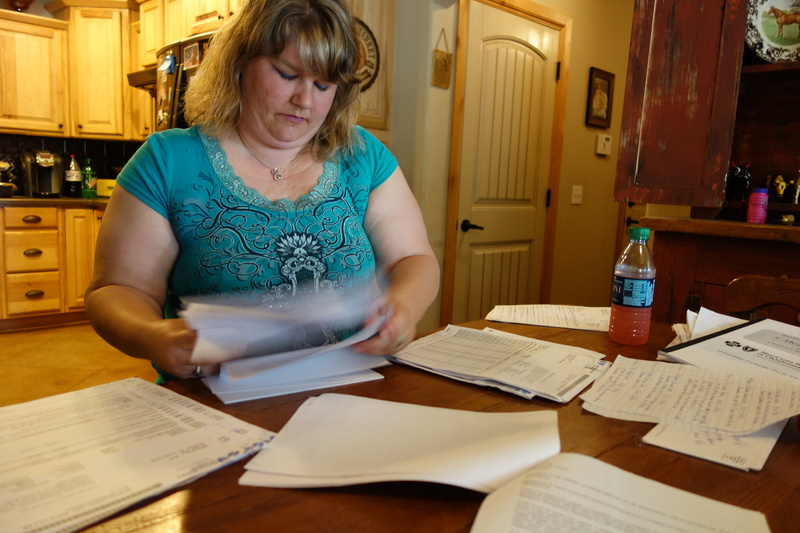 Karie Dove pages through insurance records about her daughter's mental health case. Dove said she spent thousands of dollars on her daughter's treatment because her insurance company refused to pay many claims. Karie Dove pages through insurance records about her daughter’s mental health case. Dove said she spent thousands of dollars on her daughter’s treatment because her insurance company refused to pay many claims. Oklahoma Watch is reporting a year-long series on mental-health issues in Oklahoma. The dining room table inside Karie Dove’s rural Bridge Creek home is a patchwork of papers. Many are written in the dry, technical prose used by insurance companies. The story they tell, however, is one of heartbreak and financial disaster for Dove and her family. Dove’s 19-year-old daughter suffers from bipolar disorder, a mental illness characterized by extreme shifts between mania and depression. First diagnosed in her mid-teens, she later began abusing drugs and eventually developed psychosis, with hallucinations and delusions. Months into her illness, her insurance company, Blue Cross Blue Shield of Oklahoma, began denying claims for her treatment. That included placement in a residential facility for long-term mental health and substance abuse care, letters from the company show. Dove and her husband spent their life savings of $65,000 trying to help their daughter. Dove believes if her daughter had needed inpatient treatment of a physical illness, the insurance claims likely would have been approved. State and federal laws now require “parity” in coverage for mental and physical health care, meaning insurers must offer the same treatment limits and cost-sharing terms for mental health as they do for physical health. But in many cases mental-health parity is not happening, advocates for the mentally ill say. That means those with mental illness or substance abuse problems go without needed treatment, advocates say. Traci Cook, executive director of the Oklahoma chapter of the National Alliance for Mental Illness, said she has heard numerous stories of people being denied coverage after parity laws went into effect. A national survey released by NAMI in April found that 29 percent of respondents reported being denied insurance claims for mental health treatment recommended by a clinician, with the insurer citing lack of “medical necessity.” That compared with 14 percent for denials related to medical or surgical treatment. “The same trend reported nationally is exactly what we see here (in Oklahoma),” Cook said. Blue Cross would not comment on Dove’s complaint, citing patient privacy laws. But the insurer said it complies with parity laws. For decades, many insurance companies offered less generous coverage for mental health care than for physical care — if they covered mental health at all. Co-pays, deductibles and annual and lifetime caps were higher for mental health; the limits on inpatient days and outpatient visits were more restrictive. “It would discourage people from accessing that benefit because they had to have more cash out of pocket,” said Terri White, Oklahoma Department of Mental Health and Substance Abuse Services commissioner. Many of those barriers are supposed to have ended. The first big step occurred in 1996, when Congress banned employer health plans from setting higher annual or lifetime dollar limits on mental health care. In 1999, the Oklahoma Legislature passed what’s known as a “partial parity” law, requiring insurers to provide coverage for severe mental illnesses, such as schizophrenia, bipolar disorder and major depressive disorder. Many insurers were initially unhappy with the state requirements, but came to accept them, said Mike Rhoads, deputy commissioner of life and health insurance at the Oklahoma Insurance Department. In 2008, Congress passed a law requiring parity in treatment limits and cost sharing and extended the mandates to substance abuse treatment. Then, in 2010, the Affordable Care Act defined mental health and substance abuse treatment as one of 10 essential benefits; the coverage is now part of most small group and individual health plans. Despite the changes, NAMI says its survey shows that true parity is not yet a reality. One reason is a shortage of mental health providers, especially in rural areas. Another is unclear criteria used by insurers to determine if mental health treatment is medically necessary. The report calls for more transparent and uniform criteria. “It is very difficult, if not impossible, for consumers and family members to find information on the criteria used to make such decisions,” the report says. Denials of mental-health claims have triggered lawsuits. In New York, the state attorney general has settled five cases since early 2014 against insurance companies over alleged parity violations. In some of the cases, denial rates for mental health or substance abuse treatment were seven times higher than those for physical-health care. In Chicago, a federal class action lawsuit was filed in July 2014 against Blue Cross Blue Shield’s parent company, Health Care Service Corp., one of the largest health insurers in the nation. The suit was brought by a Colorado woman whose 16-year-old daughter had been diagnosed with post-traumatic stress disorder, a major depressive disorder and anorexia, and was covered by the mother’s insurance plan. The Children\’s Recovery Center in Norman, Oklahoma, one facility where Karie Dove attempted to find treatment for her daughter. Karie Dove’s daughter was in crisis. Despite Dove’s frantic efforts to get her help, the daughter’s behavior grew more erratic and self-destructive. She began to hallucinate, became delusional and increasingly used drugs, Dove and the daughter said. When she turned 18 in late 2013, her mother told her she could no longer stay at the family’s house because she was uncontrollable and refused to help herself. She began living on the streets and in Oklahoma City homeless shelters. Between April 2012 and August 2014, she was admitted into inpatient care nine times for crisis, acute, detox and residential treatment, according to a timeline prepared by Dove. Of the 243 days she spent in an inpatient setting, Blue Cross paid for 58, Dove said. In at least three instances, Blue Cross would pre-approve from four to more than 20 days of inpatient care, then deny the claim once it had been submitted, according to denial letters provided by Dove. Pre-approval doesn’t guarantee final assent. In June 2014, the daughter was admitted to a women’s residential treatment center in Sayre. She had seizures and mentioned suicide as a way out of her problems, Dove said. Blue Cross pre-approved up to 21 days there despite appeals by the facility and Dove for more time. According to the denial letter, no more days could be approved because it was not medically necessary. The daughter had a sober support system and was not living in a dysfunctional environment, the letter said. The state paid for a few additional weeks, but then the center released her. A few days later, Dove received a letter from Blue Cross denying the claim for all 21 of the preapproved days. The service was not covered, the letter stated. “This was the final straw for me,” Dove said. She filed a complaint with the Oklahoma Insurance Department, alleging Blue Cross was violating parity requirements. A month later, without explanation, the company paid for the 21 days it had preapproved, Dove said. In the meantime, days after the complaint was filed, Dove’s daughter attempted suicide by taking pills. She was placed in Norman Regional Behavioral Center for 11 days, and Blue Cross paid the bill. Laura Brookins Fleet, executive director of the Oklahoma Association of Health Plans, which advocates for insurers, said decisions on medical necessity for inpatient treatment are based on a review of the patient’s clinical condition. The criteria for inpatient care include whether a treatment has a greater chance of producing a positive outcome than alternatives and the services and supplies cannot be safely and satisfactorily provided in an outpatient setting. Another factor is whether the treatment is more costly than other equally effective services, Fleet said. One challenge for insurers and regulators is determining what is equivalent in mental and physical health care. Intensive outpatient programs for substance abuse and a “rehab stay” for schizophrenia do not have equivalents in physical care, said an article in Health Affairs, an online publication. Parity advocates argue that the correct decision still is often clear. The NAMI report recommends stepping up enforcement of parity laws and requiring insurers to publish the criteria used in decisions. Depending on the type of insurance policy, enforcement could fall to a state insurance department, the U.S. Department of Labor or the U.S. Department of Health and Human Services. Rhoads, of the Oklahoma Insurance Department, said there have been almost no complaints about insurance companies not complying with parity laws. Dove, herself a former insurance agent, said she quit the business in part because of her experiences trying to get her daughter treatment. Dove and her husband have spent more than $65,000 of their own money, draining their 401(k) retirement accounts, and spent countless hours fighting to get their daughter treatment. In late 2014, Dove decided to stop paying for insurance coverage of her daughter, who was still homeless. “We couldn’t afford to help her any more, so if she finally wanted help again, maybe they would help her with a state bed,” Dove said. The daughter joined the ranks of Oklahoma’s more than 17,000 adults suffering from severe mental illness with no health coverage. The state paid for her subsequent visits to a crisis center and Griffin Memorial Hospital in Norman. In early May, Dove’s daughter sat on the patio of her grandparents’ home in Yukon. She had gotten out of the Canadian County jail the day before, after turning herself in on misdemeanor warrants for a probation violation. She said what drove her to enter jail was just the need for a safe place. She wanted a break from the streets and the homeless shelter. As part of her release, she is required to be part of the Program of Assertive Community Treatment, which provides mental health services. The program is only located in Oklahoma County, however, so it may take weeks for PACT to find housing there for her. She plans to return to the homeless shelter for now. Oklahoma Watch will sponsor a free community forum on May 21 in Tulsa on the often unique mental health issues faced by women.